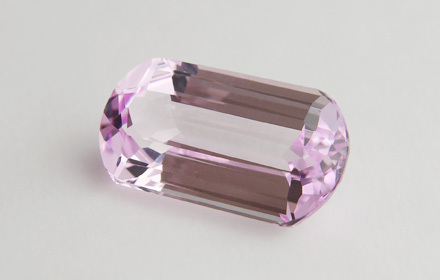 Weight: 6.29 ct; size: 14.87 | 7.90 | 4.94 mm; shape: cushion; colour: medium light purple; very slightly greyish; clarity: eye clean; cut: good. Very clean specimen; commercial cut; good polish. Manufactured mainly using the Verneuil process, also called flame fusion, developed by the French chemist Auguste Verneuil.